Other browsers that are not in the Supported Browsers matrix above may work with DTCC’s web sites and applications. They have not however been tested and certified to be compatible, and DTCC may not provide support for them. DTCC will actively support the Browsers in the Supported Browsers matrix above. To ensure the best possible customer experience, we test new releases of our externally-facing websites and web applications with the versions of the browsers and on the Operating Systems listed in the matrix above, on the release build generally available from the browser vendor at the time of testing. Later minor updates of the same browser version may not be tested but are also supported. DTCC’s web applications have been tested and are certified to work with at least one of the Supported Browsers. In certain cases, a particular application may have not yet been enhanced to support both Supported Browsers. Other browsers and other versions of the actively Supported Browsers may also be compatible with DTCC’s websites and web applications, however DTCC may not test or remediate known compatibility issues with them. DTCC will assess new versions of the Supported Browsers within 6 months of their General Availability release, and make a new version available for internal web application testing within 4.5 months of a decision to Actively Support a browser or version. In the ordinary course of business, DTCC will continue to support the designated Supported Browsers for up to 1 year following changes to this designation to allow time for users to move to newly designated actively-supported browsers or versions. DTCC will review the list of supported browsers at least annually and communicate material changes to Clients and other end users. 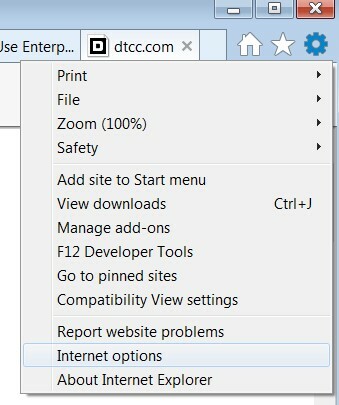 Certain DTCC web applications may render more effectively in Internet Explorer 11 (IE11) in non-enterprise mode with Compatibility View enabled in your browser. For help in configuring Compatibility View, please see the FAQs below. How do I know if my browser will work with DTCC’s websites and applications? What browser settings do I need to use DTCC’s websites and applications? What do I do if my browser is not supported? How can I find out more about your privacy and security policy? How can I get more information about the Supported Browsers? How can I disable Enterprise Mode in Internet Explore? 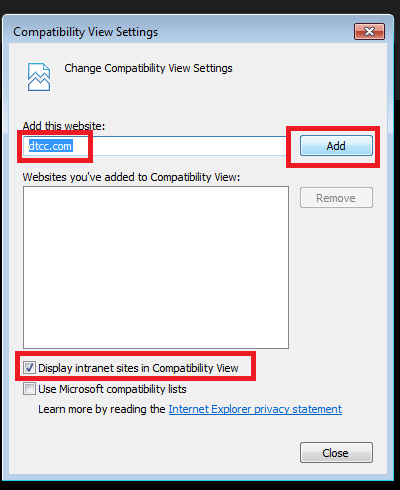 How can I enable or disable Internet Explorer's Compatibility View? 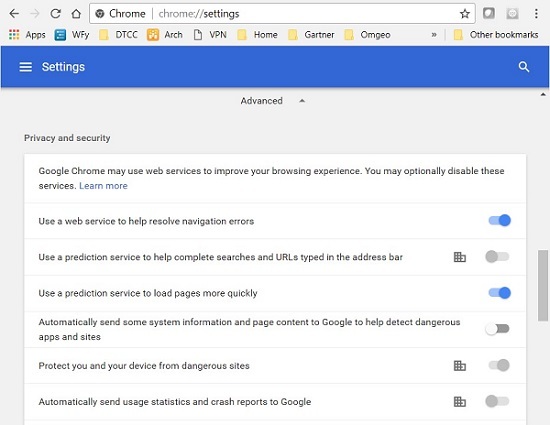 How do I know if my browser will work with DTCC’s websites and applications?All DTCC websites and web applications have been tested to work with one or both of the Supported Browsers listed at the top of this document. If your current browser does not work properly with our website or application, please try one of the Supported Browsers. The browser providers (including Microsoft and Google) regularly update their browser products to improve the security and stability of the browser. Using up-to-date browser versions can help keep your computer and your data safe from malicious attackers and other threats. DTCC recommends using one of the Supported Browsers as the best way to access our websites and applications. Many modern browsers will work with DTCC’s applications and websites. If your browser is not currently supported by DTCC and you are unable to switch to one of the Supported Browsers, you may try another modern web browser. Modern browsers including IE11 and Chrome indicate within the browser’s Location bar whether the session is encrypted. Secure sessions typically use a secure version of the web protocol, HTTPS; if HTTPS is displayed in the Location bar at the start of the address, the session uses encryption. Please contact DTCC’s Client Support organizations, or your Relationship Manager. Details about a specific web application may be available from the DTCC Product team that manages the web application. For DTCC Support, please see the Client Center, http://www.dtcc.com/client-center. How can I disable Enterprise Mode in Internet Explorer? IE 11 Enterprise mode instructs the browser to behave as if it were an earlier version of IE. These earlier versions do not support the latest HTML features and will cause errors when used to access some DTCC applications. Enterprise mode may be configured at the browser level, or at a group level through a Microsoft group policy. Close and Re-open the browser and then log back into your DTCC applications. If you do not have the authority to carry out the steps above, or If you have carried out the steps above, but are still seeing the compliance alert pop-up on the portal, the configuration may be set through an I.T. group policy that is not visible or accessible by you. Please contact your IT support group to have any DTCC URL’s removed from the Enterprise lists. DTCC applications must run in native mode or Compatibility View Mode. 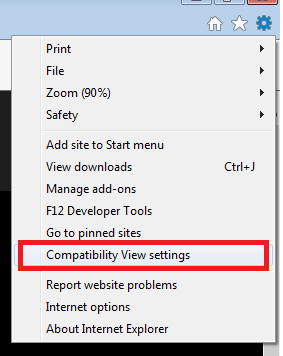 Compatibility View is a compatibility mode feature of the web browser Internet Explorer in version 8 and later. When active, Compatibility View forces IE to display the webpage by emulating an older browser as if the page were being viewed in IE7. When compatibility view is not activated, IE is said to be running in native mode (latest is Edge). Select the Display all websites in Compatibility View option and Add the site to the list of websites with Compatibility View. To disable compatibility view, select the site and click remove.